So long you are using WhatsApp, expect to see updates every day. This is what the popular mobile Instant messaging platform has been up to. Group Invitation. Group invitation is a new feature currently under development, not yet available but will be available in the future. 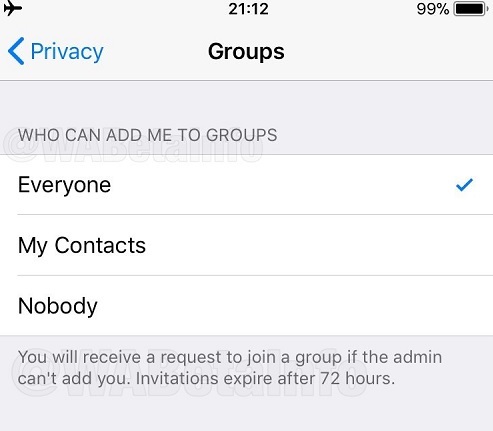 This feature will let users to automatically block others from automatically adding them to groups. I can bet that it is somehow embarrassing to wake up in the morning, only to discover that you’ve been added to different groups without your consent. With this new feature ‘Group Invitation’, you remain in charge. Currently, users can be added to groups without their permission – but the new feature will allow users to change this in their privacy settings. It will be available in the next iOS update for beta users, before rolling out to Android.